The Douglas Grey Card is something that every photographer should have in their kit bag. The Douglas Grey Card is a simple yet effective piece of kit that is an essential part of any serious photographer's toolkit. 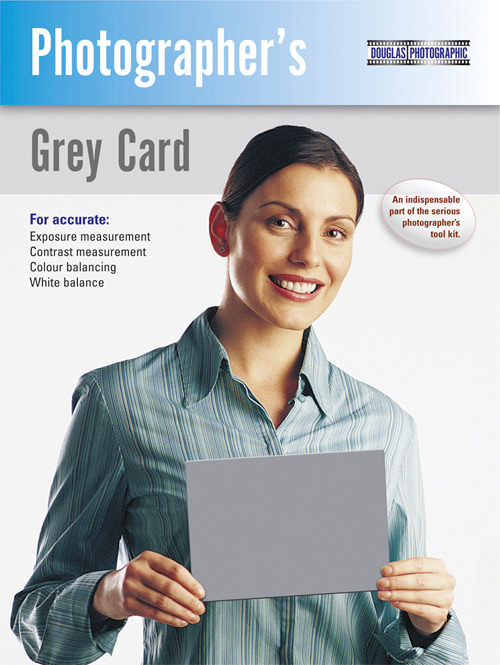 The card is ideal for exposure management, contrast measurement, colour balancing and white balance. The Douglas Grey Card Mark II combines the most advanced principles and materials with ease of use enabling 'one click' colour balance when using Photoshop and Paint Shop Pro. No artificial brighteners – which can distort exposure. Advanced, tough synthetic material – for years of use. Can be washed and therefore suitable for medical use. Stain-free – unlike traditional card, the Douglas can be written on with a Chinagraph pencil or suitable markers, then cleaned with mild detergent or spray cleaner. Reflects the same proportion of all colours of light falling – including ultra-violet and the limit of visible red. The Douglas Grey Card is available for £18.78 from the Douglas Software website.